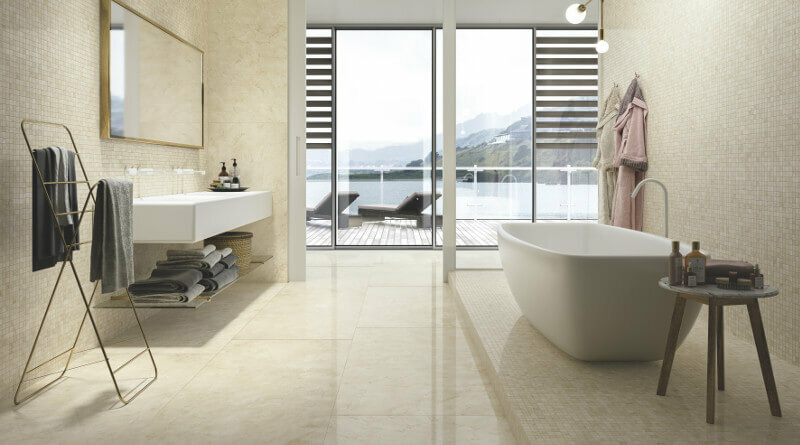 Welcome to our bathroom floor tile ideas post in partnership with Ceramiche Refin. We first discovered Refin’s tiles way back when we were researching wood look tile. 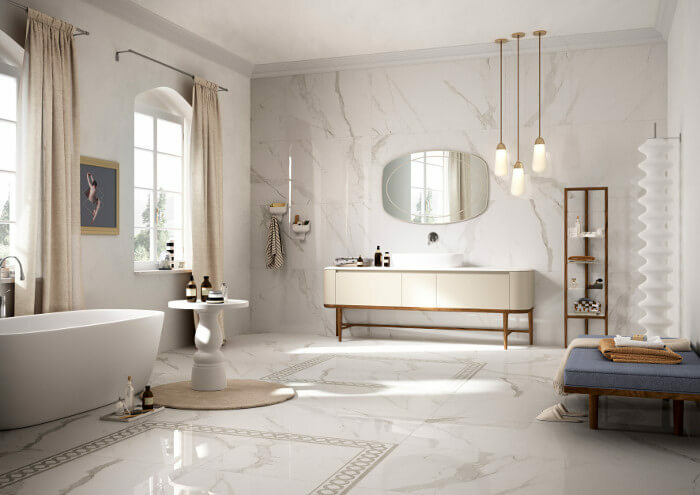 Based in Salvaterra, Italy, Ceramiche Refin produces contemporary Italian porcelain tile that are available to purchase online or at quality tile retailers in the USA and worldwide. Refin’s tiles are not only state of the art, but are also produced sustainably. And they are very beautiful! 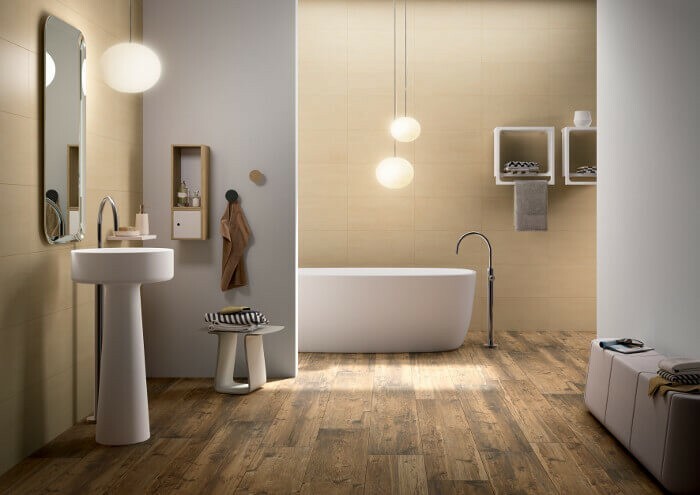 So we were delighted when Refin approached us to collaborate on this article, where we’ll be showcasing porcelain floor tiles from their collection as examples of the different bathroom tile ideas that are currently trending. 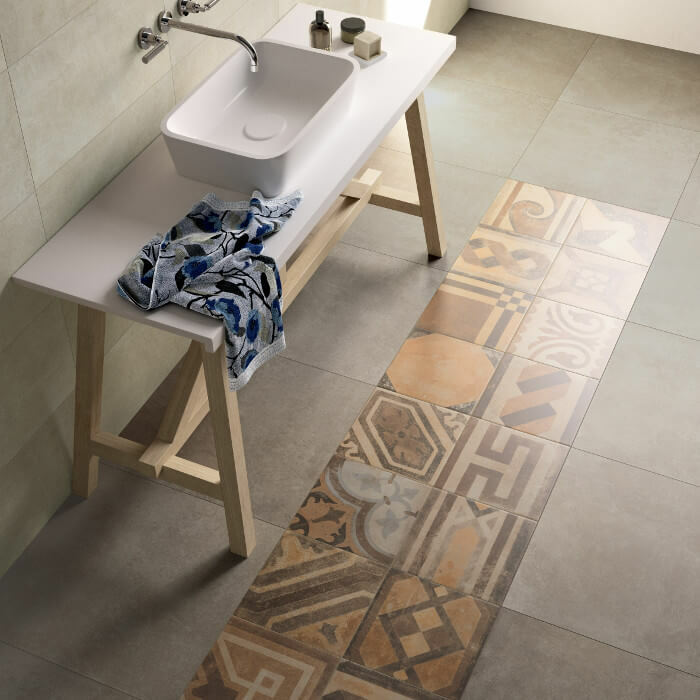 Pictured above the sublime stone look tiles from Ceramiche Refin’s Prestigio collection. If you’re planning a bathroom remodel this year, then chances are that you’ve been considering bathroom tiles for your floor. Porcelain tiles are a classic choice for bathroom flooring, as they afford a waterproof, durable and low maintenance surface. They are also available in a vast array of colors, textures, sizes and shapes. Of course, lots of choice is a great thing – but lots of choice can also make it very difficult to decide which bathroom floor tile to go for! 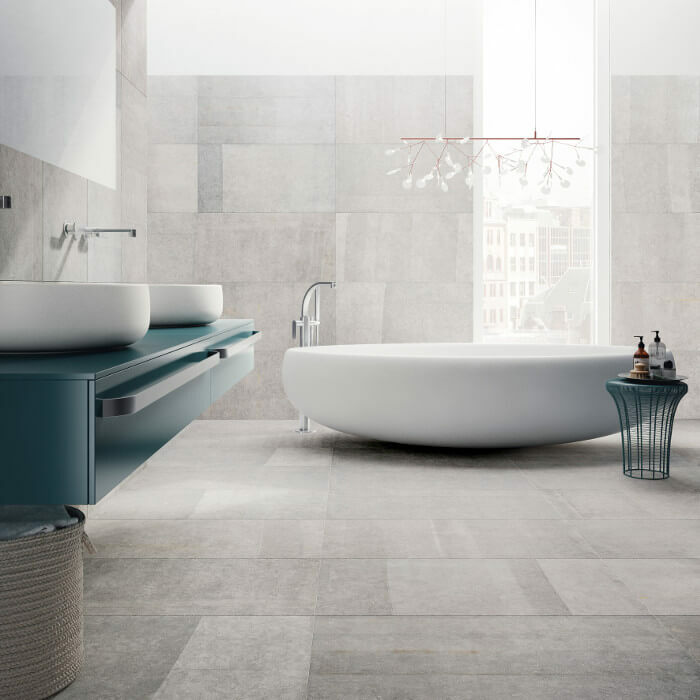 So here to get you started are eight of the best bathroom styles and the bathroom tile ideas to match, brought to you courtesy of Home Flooring Pros and Ceramiche Refin. Once you’ve chosen your favorite tile don’t forget to check out our installation guide for calculating costs. One of the biggest shifts in the way we live this past decade has been to make our personal environments more simplified, less cluttered – to create a haven of peace to come home to after stressful days at work or school. The Calm Contemporary style combines a streamlined aesthetic with soft textures and colors derived from nature, to create spaces where you can genuinely feel more relaxed. This is a great choice for bathroom design, giving a tranquil background for you to unwind. To get this look choose matt porcelain tiles in soft shades of gray, taupe, beige, cream or a very slight hint of green; opt for large tiles to enhance the calm by ensuring that there aren’t too many grout lines breaking the flow. For optimal calming effect, don’t choose tiles that are highly patterned or textured; but at the same time, don’t choose tiles that are a harsh block of monotone color. The ideal is a tile that has a slightly varied tone that gives just a hint of natural texture to create a soft, subdued look. The Cromie collection from Refin has been specifically designed to feature soft textures and colors that enhance well-being and calm. The Calm Contemporary look has a neutral aspect that will ensure its longevity; so if you’re generally interested in choosing a bathroom design that will stand the test of time, then the timeless style of Classic Elegance as also worth considering. Where this look differs is that it has an added layer of luxury, as its primarily element is deluxe stone tiles such as marble or quartz. The good news is that you can get this look without blowing the budget; these days you can get top quality stone look tiles made of porcelain that are just as realistic as the real thing! For the Classic Elegance look combine marble tiles with Art Deco inspired fittings and fixtures, and complete with sumptuous drapes. Don’t forget the devil is in the detail: decant your everyday toiletries into stylish, matching bottles; choose only the fluffiest cotton towels, and if you want to really splash out add the ultimate luxury – a mosaic inlay that will be unique to your space. Stone look tiles that imitate marble come in different colors, but choose one that most looks like classic gray-veined marble to get the timeless elegance you’re after. This stunningly elegant bathroom features the Statuario Italian floor tiles from Refin’s Prestigio collection. If you like the look of stone tiles, but feel that marble is too cool a tone for your space, then Natural Elements is the perfect bathroom style for you. Here the focus is on pairing beautiful things made from natural materials, such as creamy-toned limestone or sandstone tiles, simple yet stylish wood furniture, and an abundance of green plants. The result is a refined space, with a restful ambiance that is perfect for taking a long, relaxing bath! Again, technological advances in the tiling industry mean that you can find beautiful grès porcelain tiles that have been designed to look like authentic limestone, even down to having traces of the veining and fossil shells that you’d find in the real thing. These stone look tiles also often have a slight grainy texture to them, making them feel as authentic as they look. Stepping into a Natural Elements space gives you a sense of grounding, of being close to nature – the ultimate antidote to the rush of modern life. The limestone stone look tiles from Refin’s Pietre di Borgogna collection are perfect for a Natural Elements bathroom. Another interior design style that focusses on products made from natural materials is the Country Chic aesthetic, which gives your space a lovely, cozy and comfortable feel. Here we usually see lovingly upcycled or handmade furnishings paired with modern elements, usually in neutral colors, all underpinned by large expanses of hardwood flooring. To perfect the look, the flooring should have a rustic, slightly weathered look to it. Now, there’s no denying that hardwood flooring has a distinct warm quality and texture, so you might be thinking that there’s no way that a tiled floor could have the same kind of character. But in fact, today’s wood look porcelain tiles are so beautifully detailed in look and texture, that you can get exactly the same feel as real wood. 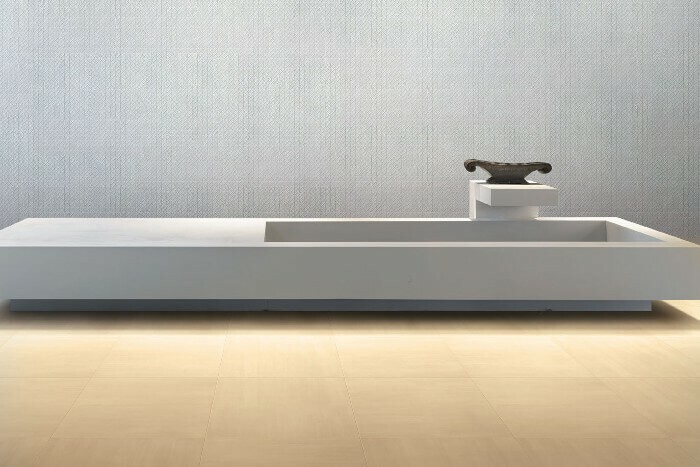 The advantage of course is that tiles are much better at dealing with water – so ideal for a bathroom – and, adding underfloor radiant heating will give you a bathroom floor tile that as warm to the touch as it is to the eye. Extra-wide wood look ceramic planks from the Larix collection from Refin are full of authentic, rustic detail. The Urban Eclectic (also known as Industrial Chic) look is a wonderful option if you’re a design magpie who likes to dip into every style in some way or other. At its core, this look is all about making your space feel very personalized and unique, by filling it with décor that you simply love and not worrying too much about everything being perfectly finished. It’s a great look for a bathroom, where you’re want to have a space that makes you feel at ease. The key things to create this look is mixing design ideas, using both recycled and brand new furnishings, and making a feature of the existing fabric of the building – think exposed bricks, visible beams and pipework. If you want to create an Urban Eclectic bathroom, but don’t have the New York loft space to go with it, then you can still create that feel by opting for cement tiles, furnishings that speak to an industrial or workplace aesthetic, and interesting objets d’art, towels and such that don’t necessarily match, but just feel right! The Bricklane collection from Refin combines plain and encaustic-style cement look tiles that work beautifully in an Urban Eclectic space. A design trend that has been on everyone’s radar in recent years, and which seems set to continue in its popularity is Cool Scandinavian. Inspired by homes in the wintry wonderlands of the Nordic countries, the look is all about keeping your space uncluttered, featuring natural materials to the max and using carefully considered colors to fully maximize the light in your home. The focus on natural materials such as woven baskets and rugs, wool blankets and handcrafted wood, keep this minimalist look cool rather than cold; and the result is a very comforting combination of unfussy furnishings and clutter free, pragmatic space. To create a Cool Scandinavian bathroom focus on materials that relate to the dramatic countryside in that region – where fjords and forests and volcanic rock dominate. Choose bathroom flooring tiles that evoke ancient stones like deep gray slate or finely textured chalk; soften it with fittings and fixtures that have clean, curvy lines, a woven basket or two, blue accents, and plenty of natural light. This slate like tile from the Blue Emotion collection at Refin combines beautifully with the other Scandinavian elements for a cool, light-filled bathroom. If you’re a fan of the Scandinavian version of minimalist design, then the Mediterranean Minimalism look is also worth considering. Here we see a similar focus on uncluttered spaces and natural materials, but paired with more modernist shapes and mixing in metallic and lacquered surfaces. Where Cool Scandinavian is more rugged and organic, Mediterranean Minimalism is more slick and structured, rather like the sublime couture made by Italian fashion houses or the precise marble stonework of ancient Greek art. To recreate the look in your bathroom, choose porcelain floor tiles with a matt, stone like finish, but softly textured and not overly detailed with veining and such. Like a giant, flat pebble, this matt floor tile provides a soft base that acts as a contrast to the streamlined, sleek, angular, geometric shapes in the fixture and fittings. A monochrome color scheme works best for this look. 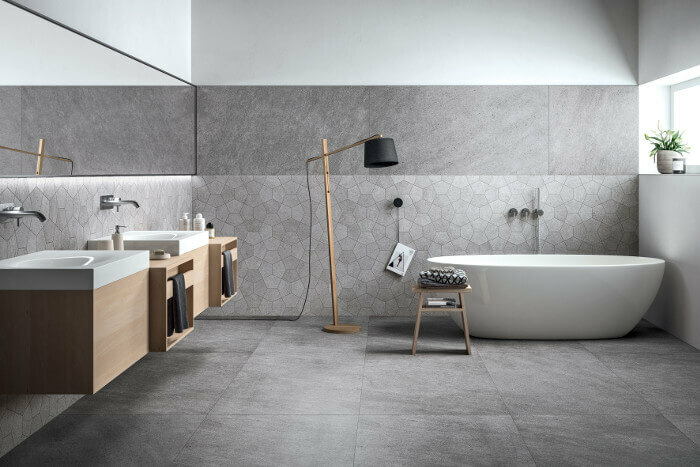 Soft matt stone look floor tiles pair with geometric wall tiles, both from Refin’s Grecale collection, to create this superb minimalist bathroom. 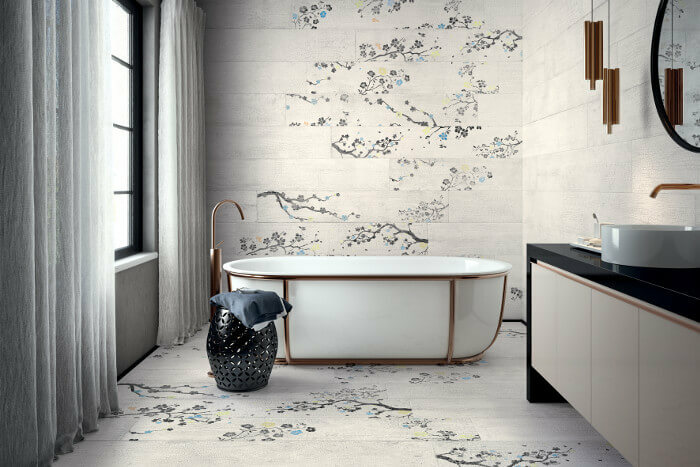 Finally, as the interior design world is now truly global, our list tile ideas for the bathroom wouldn’t be complete without an example of Oriental Influence décor. This distinct combination of extreme minimalism, dark lacquered furniture, strong linear – predominantly rectangular – lines, and geometric shapes gives a space that is all about balance and harmony. The structured space is almost always counterbalanced by organic elements such as a carefully chosen and carefully placed floral print or a living plant. Opting for an Oriental Influence bathroom design is a strong and bold choice, and needs to be well considered for it to work just right. If you’re keen to use lacquered furniture, then choose floor and wall tiles that have a matt, textured surface rather than slick, glossy ones. Add bathroom fittings in copper or brass for an earthy, fire tone, rather than cold chrome or steel; and choose floating drapes to work against the linear furniture to soften the space. Then lean back and find your inner Zen in your perfect bathroom sanctuary! Refin’s Kasai collection, based on the traditional Japanese charred wood technique of Shou Sugi Ban, is the ultimate tile choice for a bathroom with Oriental inspiration. Ceramiche Refin have many more fabulous porcelain tiles and styles for you to choose from for every room of the house. Light colors work better than dark colors to make a room feel bigger. Since many home bathrooms tend to be a small space, this is a useful rule to consider. You are also better off choosing a grout color that tones in with the tile – for example, a light cream grout with cream colored tiles, as opposed to a dark grout – to give the illusion of a more seamless, spacious area. If you have a small bathroom, laying your bathroom floor tiles on a diagonal axis will trick your brain into thinking the space is larger. Of course laying tiles diagonally can be challenging for non-pros, but there are tools on the market that can help you cut and lay tiles in this way. Larger tile surfaces mean fewer grout lines which – especially if the grout is toned with the tile – makes for a more streamlined look. However, you need to be careful not to use super sized tiles in a very small bathroom that will overwhelm the space. Mosaic tiles paired with similar toned grout will create a textured but harmonious bathroom flooring surface, making a space feel cozy but not cramped. Using a contrasting grout with mosaic tiles will add a grid-like design that can make a small space feel closed in, but can create drama in a larger space. To me it looks like soapstone rather than marble.we have soapstone counters in our MCM and the veining is very similar.